This easy Sesame Asian Slaw recipe is quick and easy to make, tossed with the yummiest sesame vinaigrette, and can easily double as a side salad or main dish! It’s the perfect light side dish to pair with with all of your favorite rice dishes, noodles, curries, dumplings, soups, satays, and stir-fries galore. It’s the ultimate potluck dish as well — easy to make ahead and transport to picnics or parties, naturally gluten-free, and always a crowd fave. It can also easily double as a big entree salad, especially if you add in some extra protein (such as chicken, steak, carnitas, shrimp, tofu). But mostly, I just love this salad because it’s just super light and fresh and flavorful and makes me feel great. 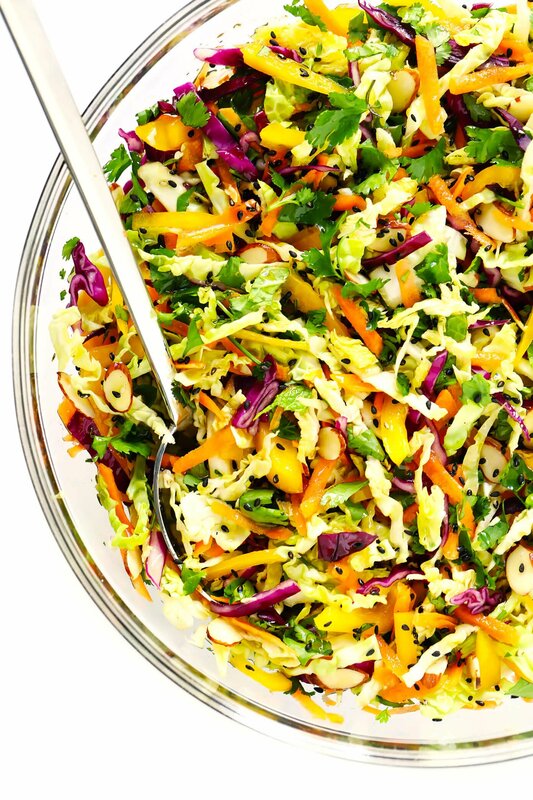 As is the case with all of these side salads this week, this Asian slaw recipe is also 100% customizable with whatever ingredients you happen to have on hand. 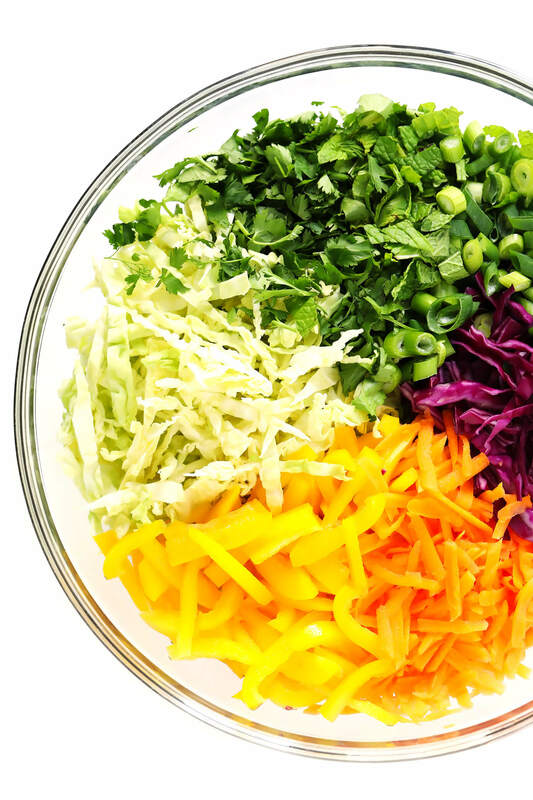 So gather up a rainbow of whatever healthy slaw ingredients you love best, and let’s make some salad together! Shredded Carrots: Most bagged coleslaws also contain shredded carrots, but I like to add in more for that extra sweet and crunchy goodness. Veggies: I just chopped up a yellow bell pepper for this slaw. But avocado would also be awesome, or there are all sorts of other crunchy slaw veggies that you’re welcome to add in too (see ideas below). Onions: I used thinly-sliced green onions for this slaw. But thinly-sliced red onions would work too. Almonds: Sliced or slivered, and preferably toasted a bit to bring out their flavor. Sesame seeds: I also love sprinkling on some sesame seeds (white or black) at the end for added crunch and flavor. Sesame vinaigrette: Made with oil, soy sauce, rice vinegar, maple syrup (or honey), toasted sesame oil, ground ginger, garlic, S&P. Make your dressing. Whisk all of the ingredients together in a small bowl until combined. Or — my preferred method — just add them to a mason jar and shake-shake-shake until the dressing is ready to go. Taste and add in extra maple syrup or honey if you would like a sweeter dressing. Mix the salad. Then combine all of your salad ingredients in a large mixing bowl. Drizzle evenly with the dressing and toss until combined. Serve! And serve the sesame slaw right away while it’s nice and fresh! Add a protein: Cooked chicken, steak , pork, shrimp, salmon, or tofu would all be great in this salad. Add extra fresh veggies: Such as cucumber, radishes, edamame, or — my top rec — avocado!! Add fruit: Such as diced fresh mango, pineapple or orange. Add crispy wonton strips: Always good with a slaw! 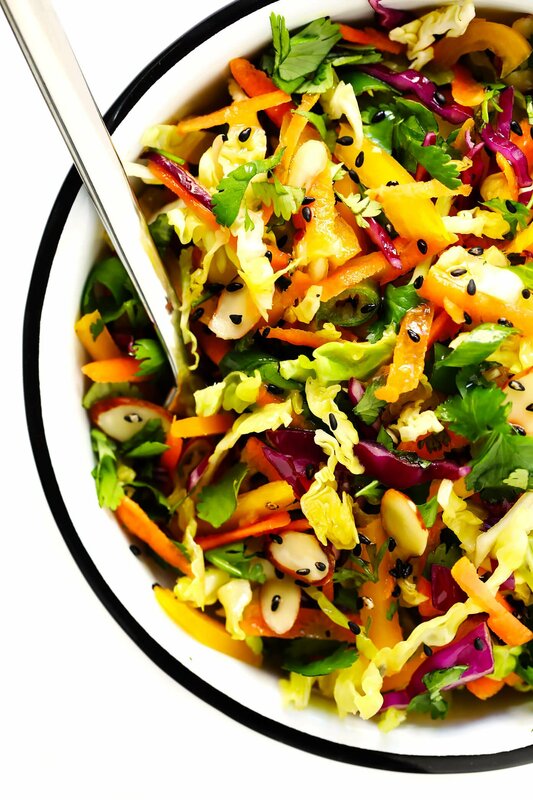 Add more nuts: Chopped peanuts or cashews would also be delicious in this salad. 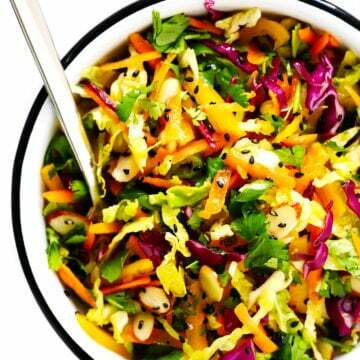 Add a kick: If you would like your slaw to be a bit spicier, add some sriracha or hot chili oil to the vinaigrette. Or just drizzle it directly onto the salad itself. If you’re looking for more side salad inspiration, here are some of my faves! 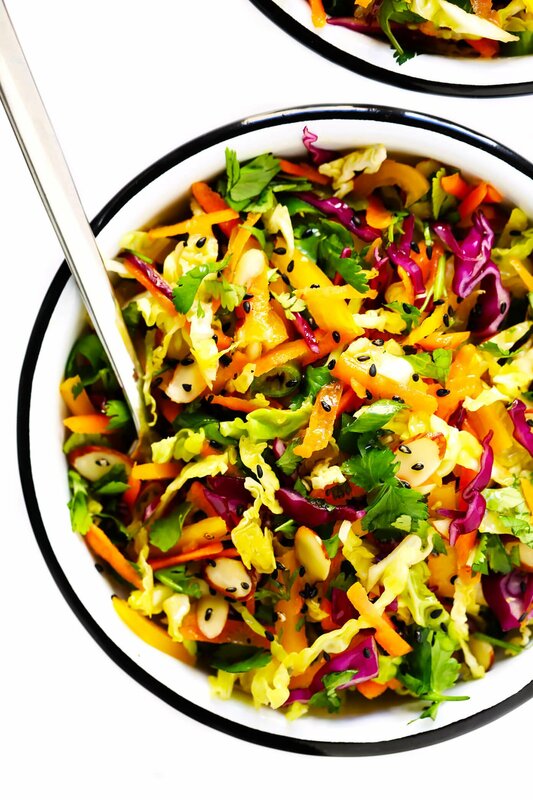 This easy Sesame Asian Slaw recipe is quick and easy to make, tossed with the yummiest sesame vinaigrette, and can easily double as a side salad or main dish. See notes above for possible ingredient variations. To Make The Vinaigrette: Whisk all ingredients together in a bowl (or shake together in a mason jar) until combined. Taste and add additional sweetener if desired. Use immediately or refrigerate in a sealed container for up to 3 days. 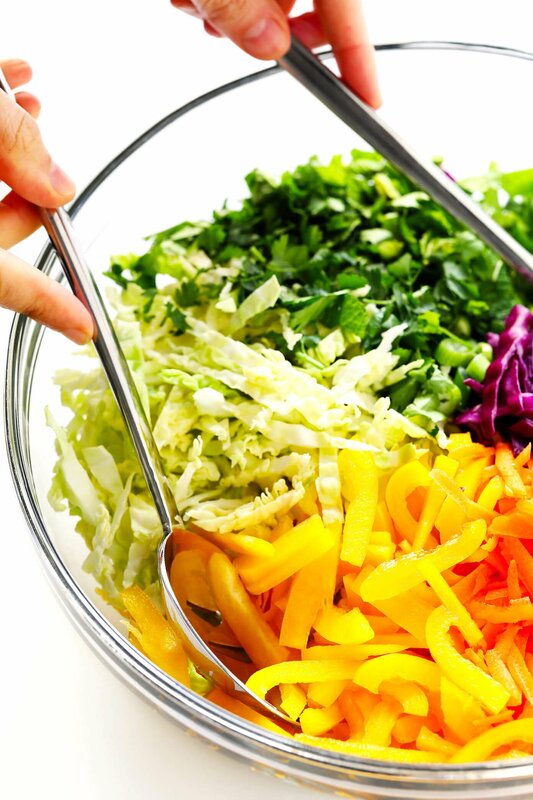 To Make The Slaw: Combine all ingredients in a large salad bowl, drizzle evenly with the vinaigrette, and toss until evenly combined. Serve immediately and enjoy! *If making this salad gluten-free, sub in GF tamari.